If you happen to be a fossil cat, there are two main routes to get media attention. The first – be Smilodon. The celebrated sabercat is a media darling, and any major study about how this felid fed has a good chance of getting some play in the news. Whether or not the cheetah considered humans prey isn’t as clear. The prehistoric cat is estimated to have been about twice as large as modern-day cheetahs, and any carnivore of such size would have been best avoided by our prehistoric kin. (The humans at this site have been given the name Homo georgicus, and are often presented as being intermediate in anatomy between the earlier species of Homo in Africa and Homo erectus.) 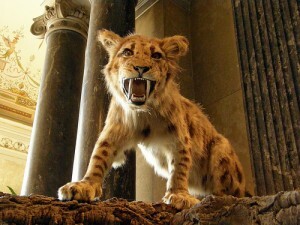 One of the study’s authors, Ralf-Dietrich Kahlke, is quoted as saying that cheetahs may have killed humans in skirmishes over carcasses, but that the humans who inhabited Dmanisi around 1.8 million years ago were probably not hunted down by the fleet-footed cats. Unlike the sabercats found at the same site as our collateral relative Sahelanthropus at a 7 million year old site in Chad, the cheetah of Dmanisi does not fit the role of a rapacious hunter with a taste for our close relatives. Nevertheless, the idea that big cats have provided humans with free, already-been-chewed meals over the past six million years is popular within paleoanthropology. The trouble is that this idea is nearly impossible to investigate directly, and plenty of “everybody knows” assumptions crawl into hypotheses about the relationship between prehistoric humans and carnivores. Wherever humans and big cats overlap in the prehistoric past, the felids are often thought of as being unwilling providers of excess meat. Here’s the basic idea. In the past, just as now, big cats were hypercarnivores. They primarily fed on soft tissues and typically didn’t bother with cracking open bones for the marrow inside. (That’s why you open a can of gooshy food when you want to give your kitty a treat and don’t give them a bone.) Some – such as the Smilodon preserved in the famous La Brea tar pits – may have habitually consumed more bone than living big cats, or perhaps they were forced to eat more of the animals they killed during tough times, but cats are not known from being bone-crackers like many fossil dogs and hyenas. Sabercats, especially, have been traditionally cast as such dedicated soft-tissue specialists that they left plenty of meat on carcasses before moving on, and so prehistoric humans who didn’t mind cat leftovers could easily bring a bit of protein into their diet. The Dmanisi cheetah is hypothesized as carrying out a similar role – a messy eater that would have left plenty of visceral tidbits around the landscape. Not much of the large Pleistocene cheetah has been found at Dmanisi. The species is represented only by a few parts of a forelimb that had previously been considered of uncertain identity. (Two sabercats had been found at Dmanisi – Homotherium crenatidens and Megantereon cultridens – but the anatomy of the leg bones did not match either of them, nor did the fossils correspond to a Eurasian jaguar found there.) The parts referred to Acinonyx pardinensis include a shoulder blade, a humerus, a radius, an ulna, and several bones of the paw, altogether representing the majority of the cat’s forelimb. The association of these bones, or whether they came from a single individual, is not explained in the paper, but Hemmer and colleagues use them to come up with a body mass estimate for the big, bad cheetah. Based upon the relationship between one of the paw bones – a metacarpal – and body size, the researchers produced a body mass estimate of about 220 lbs (although it should be remembered that this is a rough figure that is only a ballpark idea of the animal’s size). It’s tough extrapolating the mass of the muscle, viscera, and all the other bones from a small portion of bone. Nevertheless, the size of the bones alone indicate that the Dmanisi cheetah was a large cat, and, using the body mass estimate, Hemmer and co-authors attempted to come up with an idea of how much food the carnivore would have taken down. Based upon the behavior and prey preferences of modern cheetahs, the researchers propose that the Dmanisi cheetah would have run down calves and foals of large herbivores, specializing on prey weighing around 100 lbs or so. Assuming that the extinct cheetah was as successful at hunting as the living species, the cat is estimated to have acquired a total of over 16,500 lbs of prey a year. That’s a lot of meat, and there would have undoubtedly been leftovers. “This would have qualified the Dmanisi cat to take its place as the top carcass producer within the carnivore community,” Hemmer and co-authors speculate, and so the loss of some kills to other meat-eaters in the neighborhood would have been tolerable. That may have been just as well. Again citing the behavior of modern-day cheetahs, the scientists state that cheetahs are fresh-meat specialists and leave considerable parts of larger kills to go to waste. No direct evidence for the feeding habits of the Pleistocene cheetah is cited – it is taken for granted that the Dmanisi cat was just like its living relative. If there was a good sample of teeth and jaws, for example, the amount of tooth wear could be examined to see if the Dmanisi cheetah was chewing on bone more often than modern cheetahs or otherwise eating more of a carcass. Likewise, the larger size of the Dmanisi cheetah raises the question of whether it could have hunted just like its living cousin. The extant cheetah species relies on speed for the kill – forcing prey into a run and then tripping it – but would a cheetah that was twice as massive hunt the same way? Would it have been fast enough to employ the same techniques, or would it have done something different? Likewise, would a plus-sized cheetah be as easily driven from a kill as their modern day counterpart? The assumption is yes, but how can we test such an assumption about the interactions of extinct species, some of which – such as the sabercats which lived in the same place – that have no living counterparts? Too often Pleistocene animals are thought to act just like the stereotyped image of their modern counterparts. Variation and flexibility among animals is often overlooked as we search for associations between the present and the not-too-distant past. In this case, we’ve got the forelimbs bones of a poorly-known giant cheetah which lived almost two million years ago. Are we perhaps extending our arguments too far when we assume that it acted just like a larger version of the living cheetah species? Despite how little we know about the Dmanisi cheetah, though, it is likely that the cat’s kills were sometimes stolen by other meat-eaters. This phenomenon is called kleptoparisitism, and is often seen in areas where large carnivores overlap – grizzlies sometimes steal the kills of wolves in Yellowstone, just as prides of lions and packs of hyenas often vie for control of carcasses on the Serengeti. How beneficial the Dmanisi cheetah would have been to the diets of other carnivores is unclear, but Hemmer and co-authors go on to speculate that the cat may have provided the humans at the site with some food. They mention that there is some evidence that the Dmanisi hominins were able to access and butcher mammal carcasses without carnivore interference – there is no indication that the animals had been heavily picked over by carnivores beforehand. This could mean that the humans were “power scavengers” that ran the cheetahs off fresh kills – something that Hemmer and co-authors consider consistent with the picture of the Dmanisi cheetah as a wuss-puss – but it could also indicate that the humans were successfully hunting medium- to large-sized prey. The evidence only indicates that the humans butchered a carcass that was not taken down to the bone by carnivores. This evidence could be used in support of either hypothesis, and it is difficult – if not presently impossible – to distinguish which was actually the case. A restoration of Megantereon. I have a feeling the real thing would not look quite so cuddly. "Who's a cute little sabercat?" Image by Flickr user belgianchocolate. This is not the first time Pleistocene humans have been proposed as significant kleptoparisites of fossil cats. Though not about the Dmanisi cheetah, a paper recently published by Margaret Lewis and Lars Werdelin bears on the question of how much meat big cats may have provided early humans. The review focuses on the relationship between humans in Eurasia and Megantereon – a relatively small sabercat that, according to some paleoanthropologists, may have left a bloody trail of carcasses which humans followed out of Africa. A large part of Lewis and Werdelin’s paper was concerned with untangling the identity of Megantereon specimens found at hominin sites in Eurasia – whether they were descendants of an earlier Eurasian species or extensions of African populations – but this is ancillary to what we’re talking about here. Regardless of where they came from, could these sabercats have provided humans was a significant amount of meat? The cats were certainly beefy – like Smilodon in North America, they had powerfully-muscled forelimbs to bring down large prey – but whether humans got any of the spoils from these kills is another question. How useful a Megantereon kill would have been to humans would have depended upon when the scavengers arrived. If the hominins were able to steal a kill early on, there would have been a good deal of meat. If they arrived late, then there would have been little more than marrow and a few rotting scraps of flesh. Despite what has often been believed about sabercats, they were likely quite capable of defleshing a carcass thanks to their rough tongues and a battery of incisor teeth which stuck out in front of their formidable canines. It was not as if Megantereon was taking down prey, eating only the softest parts, and then leaving most of the carcass behind. Frustratingly, we can’t directly observe the interactions between early humans, Megantereon, and the other large carnivores which shared the same habitats. As Lewis and Werdelin point out, though, frequent theft of kills is very stressful for predators. If smaller or low-ranking carnivores are regular victims of carcass theft, they are often driven into marginal areas or may even disappear from an area. The common co-occurrence of hominins and Megantereon would therefore suggest that humans were not driving the sabercat off kills over and over again. If humans were that much of a nuisance, in other words, the cats would have moved off elsewhere. (In fact, other large carnivores – such as large hyenas and bigger sabercats – were likely bigger threats to Megantereon meals.) Humans certainly could have scavenged from Megantereon kills – or the kills of other large carnivores – on occasion, but there is no evidence to think that the sabercat provided a regular source of protein for enterprising hominins. The argument that humans relied and sabercats and other felids for meat is based upon often-mistaken assumptions about how the animals would have fed and behaved. Just as Megantereon wasn’t the lone carnivore in its habitat, neither was the Dmanisi cheetah the only large carnivore during its time. Hemmer and co-authors list a jaguar, (Panthera onca georgica), two sabercats (Megantereon cultridens and Homotherium crenatidens), at least one hyena (Pachycrocuta perrieri), a dog (Canis etruscus), and a bear (Ursus etruscus) as other large carnivores present in the ecosystem. For a big cheetah, these animals were probably more significant competitors and kletoparisites. Maybe humans scavenged giant cheetah kills, and maybe they did not, but there is no clear indication that the cheetah was a significant source of food for the humans of Dmanisi 1.8 million years ago. Without additional evidence – particularly a nice collection of teeth that can be studied both anatomically and geochemically – it is difficult to say what role ecological role the Dmanisi cheetah played. The picture painted by Hemmer and co-authors is an estimate based on an estimate and bounded by a number of assumptions based upon the behavior of the cat’s closest living relative. All of the conceits are reasonable based upon the available information, but all of these hypotheses require further investigation through more direct lines of evidence. On paper, the Dmanisi cheetah might look like a bigger version of the spotted cat we’re all familiar with, but did the real animal act within the behavioral boundaries we have set for it? Top Image: A cheetah rests at an impala kill. Image by JerryFriedman and from Wikipedia.